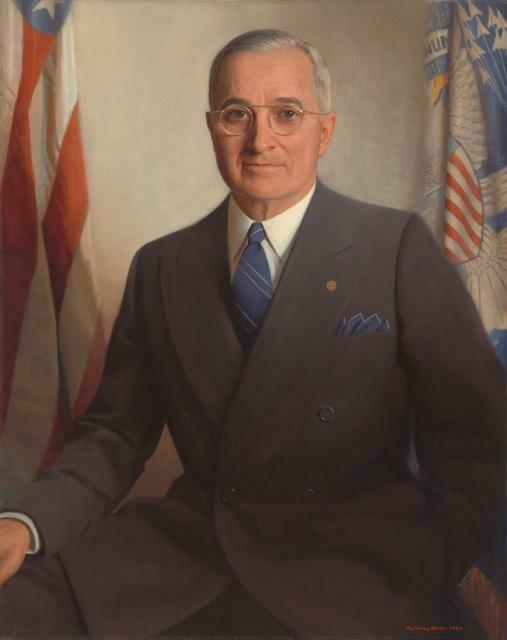 This 1945 portrait of Harry S. Truman will be the latest addition to the Smithsonian's National Portrait Gallery. A reproduction will be on permanent display at the Plaza branch of the Kansas City Public Library. A portrait from the early days of Harry S. Truman's presidency goes on display Wednesday at the Plaza branch of the Kansas City Public Library. A reproduction of the 1945 original, the painting is the latest addition to the Smithsonian's National Portrait Gallery. The picture, which Truman told Life magazine was "too flattering," will be unveiled during an event at the library. Presenting at the event will be National Portrait Gallery director Kim Sajet and senior historian David C. Ward. They will also discuss portraiture as an art form and a portal into history, as well a future plans for the gallery. "Actually we do have another portrait of the president in the galleries, but to be honest, we didn't feel like it did him justice," Sajet told Up To Date host Steve Kraske. "It sort of has this soft romantic focus." According to Sajet, Truman "sat five times" for the artist Jay Wesley Jacobs, also a Missouri native, for the 1945 portrait. It was intended as a gift to Congress, but remained in the collection of a family until recently. The painting was purchased with support from the William T. Kemper Foundation in Kansas City, Mo. HEAR MORE: The event will be held at Plaza Branch, 4801 Main St., on Wednesday. The program will begin at 6:30 p.m., following a reception at 6 p.m. To reserve a seat, visit the Kansas City Public Library event page. Candidates crisscross the country with relative ease these days, but back in 1948, a real train whistle ruled a whistle-stop campaign. That year the presidency went to Harry Truman after he covered 31,000 miles by rail and gave 352 speeches along the way. On Monday's Up to Date, we take a look at the underdog effort that kept Truman in the White House. Looking back, desegregating the military seems like the obvious thing to do, but in the 1940s and 50s, it wasn't so clear for Harry Truman.